November is for NaNoWriMo! Writing a 50,000 word novel in 30 days flat isn’t as crazy as it sounds. Calling it a "novel" is generous because anything you get out of such a frantic writing month would need a lot of work to be publishable. But you have a first draft to work from. This year I’m writing a sequel to my 2009 novel, "Between Universes". When I read that one, I was suprised to find it didn’t stink and I still liked the story. Sure it has rough spots and dead patches and some clunky dialog and odd coincidences, but it has a big orange tom cat and characters who all want something, though most of them don’t get it which makes for interesting situations to play with. 3041 words. A little writing before work, and a chunk afterwards. With my car in the garage for a wonky thermostat and bad battery, I worked from home today, saving my drive time for writing. Skived off karate and went to the Barnes & Noble write-in at West County Mall. Made my personal Nov 1st goal of 3000 words and had a celebratory cookie. 5054 words, 2013 today. Wrote 400 words before work while sat in front of my light box, another 700 at lunch in the conference room with Harold Chester, and the rest at home in an empty house while Hubby was out. My bad guy is a little too likeable right now, but I get to write some really nasty characters in another scene or so. 7225 words, 2171 today. Strong finish, encouraged by St Louis wrimos Beta Wulf and jsights on Twitter. Both of them incorporated the phrase "pterodactyl of love" into their novels after I tweeted about mis-hearing a DJ Sammy song "Paradise of Love". Pterodactyls, they’re a Thing. 9251 words, 2026 today. Put a regional dare on the NaNoWriMo forums to get people to put the phrase "pterodactyl of love" into their novel, also on Google+. 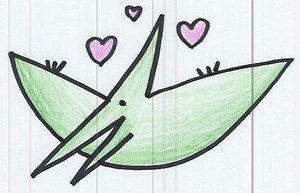 Someone sent me a link to the pterodactyl of love on Twitter! NaNoWriMo tweeted a challenge: Get to 15k by Sunday. I’m going to try. 12271 words, 3020 today. Got up to 2000 words at the Crooked Tree Coffee House write-in in St Charles, aided by two 15 minute word wars (I won both, 625 words and 706 words). Finished up at home and crossed the 3k barrier for the day. Another 3k day tomorrow and I’ll make 15k by Sunday and be well ahead of the curve. Story going well, writing monsters in the dark. 15305 words, 3034 today. Wrote a thousand words before the write-in at Clayton Bread Co, finished up the rest there, amid some truly eyebrow-raising discussions topic ranging from Hello Kitty items through flying whorehouses. Brain-fried by the end of it, but good to be among friends. 15722 words, 417 today. No lunchtime writing, met a former work friend for lunch instead. Wrote a little at home, but tired from karate.